Article outlining the connection between the Iran-Iraq war and the internal tensions within Iran's Islamic state machine. Today, the arms race between the Soviet Union and the USA has lost its initial meaning and become integrated into the state ideology of each country and now functions as an apparatus for the legitimization of the policies of these two countries. IN CONTRAST to the popular viewpoint which holds that the roots of the Iran-Iraq war are to be found in the past histories of these two countries and in the border conflicts and disputes between them, I maintain that the war represents, not such a historical continuity with the past, but rather a break. The causes of the war must be sought in the novelty of the Iranian revolution, and not in any other previous historical occurrence. Other elements, such as border and personality conflicts between Khomeini and Saddam Hussein, and international pressures, should be seen as secondary contributing factors to the war, important in their impact on the Iranian revolution and its dynamic. First, there is the fact that the shi'i clergy, as an independent social force, share power within the regime. This makes it difficult to clarify the class nature of the Islamic Republic. Second, comes the incompatibility of the various factions who were brought to power (the liberals, the Hojatie, and so on). Finally, (and as a result of the above), there is the inability of the regime to present any comprehensive economic and social programme for the country. 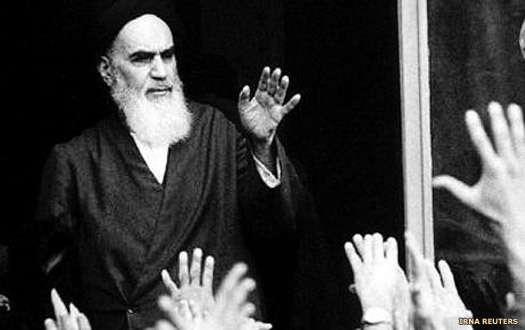 The basic factors holding together this heterogeneous system are: a certain limited commonality of interests between them; the fact that they all desire some kind of Islamic government (the ideological factor); and the decisive personal role of Khomeini himself as the main unifying factor for the transitional government. A 'normal' regime emerging from a revolutionary process needs to present and implement programmes dealing with the society and the economy, to ensure stability and continuity. However, the Islamic Republic of Iran, an exceptional and unstable regime, has maintained itself by keeping Iranian society in a tense and excited state through manipulating the population for its own purposes. The regime's most significant characteristic is its surprising ability to make effective use of the state apparatus for its own ideological purposes. The populace has been kept mobilized and 'on the scene' through the artificial manipulation of real or imagined antagonists in situations such as the 'liberation of Palestine', the American hostages affair and the 'taking of Kerbala', all just such devices used by the regime to hold on to power. In these conditions the state apparatus (both ideological and coercive) is crisis-forming in the sense that it exists and develops on the basis of real mobilizations that are organized around fabricated scenarios. Due to the new state's inability to answer the needs of the population, the diverting of attention towards real or artificial crises has become the best means of escape for the regime, and paradoxically a means of holding on to power. In such a situation the regime has only two alternatives in any particular course of action. The first is to prolong the life of the transitional regime by using the threat of foreign enemies and the creation of these crisis-forming institutions. It is obviously impossible to keep up this approach indefinitely, but this does not preclude its being maintained for quite a long period of time. The second alternative would be for one of the factions to consolidate power by eliminating all the others, and formulating specific social and economic reforms to return Iranian society to a more or less stable condition. These actions would dissolve what we have called the transitory nature of the existing government. In this way the state would take on a specific class nature. This alternative can occur only through the formation of a new government, by whatever means. Until the second alternative is carried out, the regime is dependent on the first. In other words, its very existence depends on the maintenance of a highly chaotic and perpetually renewable succession of crises. The Iran-Iraq war is being used by the state apparatus in just such a way. First, the war is being used as a means of legitimization to substitute for the lack of organized programming and the absence of any degree of responsiveness to the social and economic needs of the populace. Second, the war is more and more an ideological cover for the escalation of oppressive policies that might otherwise have been harder to carry out. Third, the war serves as a platform for indoctrination and the dissemination of the official ideology. It has been used, for example, to justify the export of the Islamic revolution throughout many countries in the region. War has been used in a similar way in at least two previous situations - slavery and fascism. During the slave mode of production, war was a means of obtaining more slaves. Under fascism, the new state arose from a situation of social crisis. It used war as a means of social and political reorganization, and as an answer to the otherwise insoluble (from its standpoint) social crisis from which it had arisen. The Iranian utilization of the war for 'state-forming' purposes more closely resembles this second case, and it should not go unnoticed that there are other similarities between fascism and the absolutism of Islamic ideology, including the expansionist idea of exporting the Islamic revolution. An interesting example of the use of the war as an instrument of internal coercion can also be seen in the case of the Tehran bus drivers' strike. Initially the strike was quite successful and the government was unable to break it. It came to an end, however, when the government brought in the bodies of dead soldiers, parading them across the picket lines and claiming that, 'While people are being killed at the front, you bus drivers are demanding increased wages and creating problems for the government.' The tactic was very effective. It stimulated a sense of guilt in the workers and cultivated their nationalistic and religious tendencies. A consideration of the regime's internal divisions and their relation to the war makes our argument more specific. During the disputes between the two factions around Bani Sadr and the 'Imam's line', both sides made an effort to monopolize the issue of the war. At the height of the dispute, Bani Sadr, wearing combat uniform, went to the front saying that the issue of the war was absolutely central. He did his best to take control of the war-related institutions with the aim of consolidating the powers of his faction. His rivals, on the other hand, belittled his and the army's efforts, and built themselves up around the Revolutionary Guards. The various factions within the regime have been aware of the vital role of the war as a means of consolidating the new state. For example, the fight between the Khomeini faction and Bani Sadr in the first year of the war was a direct expression of each party's desire to manipulate the war in order to consolidate its own position within the regime. Even today, after four long years of warfare, the conflicts among the current factions of the regime can be seen in the approach of each towards the war. One approach is that of the Mousavi-Khamena'i faction, which stresses the need for long-term economic programmes, and is in favour of more conciliatory measures in respect of the war. The other faction, that of Hashem Rafsanjani (the speaker of the parliament), is in favour of maintaining the transitional nature of the state and has no specific economic programmes. It views the war as a lifesaver for the regime, and believes that it can and should continue to play that role. As the power of the Mousavi-Khamena'i faction increases, the other intensifies its pro-war rhetoric. This illustrates the importance of the war, its outcome and/or continuation, in the consolidation of power by either of these two main factions within the regime. It is Khomeini's role today to keep these factions in balance and held together. This restricts the possibility of either side consolidating its power, and thereby indirectly ensures the continuation of the war. As far as the future of the war is concerned, it seems that its course is dependent on further developments within the transitional regime. As long as the regime is able and willing to maintain its present transitional nature, the war will in all likelihood continue to be used to bolster its position. A change in the state of the war may emerge as a direct outcome of the internal conflicts between the regime's factions. Of course, one cannot ignore the fact that Khomeini's death will also play an important role in determining the future of the Iran-Iraq war.